Geranium plants are offered by a range of wholesale growers and are sold in retail nurseries and garden centres across Australia. Being one of the most popular garden plants for many years, much development has gone into flower size as well as plant hardiness and form. Flowers are long lasting, some very large and colorful,other more delicate. One of the easiest of all garden plants to grow, they thrive in heat and new varieties also suit the humidity of the Queensland climate. All varieties perform best when provided protection form the very hot afternoon summer sun. Mostly offered in 10 – 15cm pots however also sold in trays by some growers. 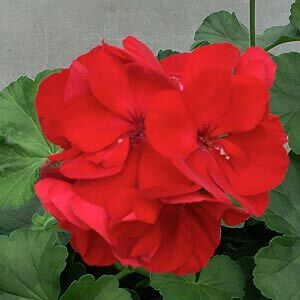 Used widely in landscaping, both in cottage gardens and more formal plantings depending on variety, Geraniums are also widely grown in containers as well as hanging baskets. Double flowering and semis doubles and a range of flower colours are all available through the year.